Mooboo opened its doors at the Oxford Road entrance to the centre on the 14th of July, and offers a huge selection of teas, smoothies and mocktails. Their passion is to create the highest quality drinks and desserts for all, and stay one step ahead of the competition! 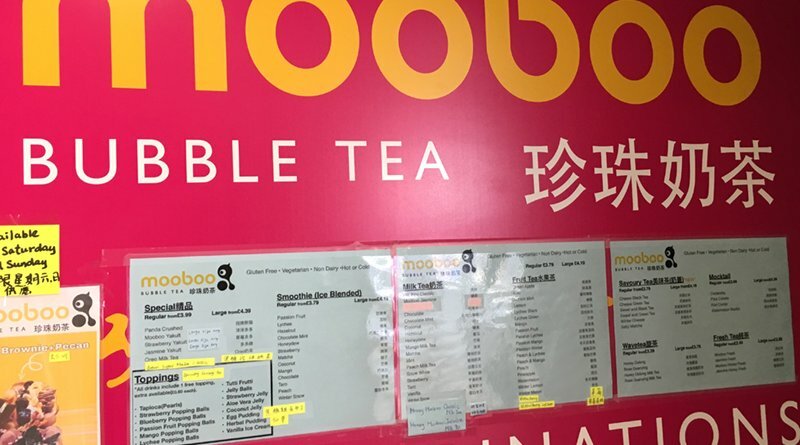 Mooboo’s menu boasts an array of flavours such as Green Apple and Passion Fruit, as well as Hazelnut Milk Tea, Mango Milk Tea and Jasmine Yakult. The majority of drinks on the menu can be served both hot and cold, making it the ideal refreshment stop, whatever the weather. The shop will be closed on all Mondays from December the 3rd, however all other days will continue as normal. Additionally, the shop will be closed on December the 24th-26th, as well as December the 31st and the 1st of January.